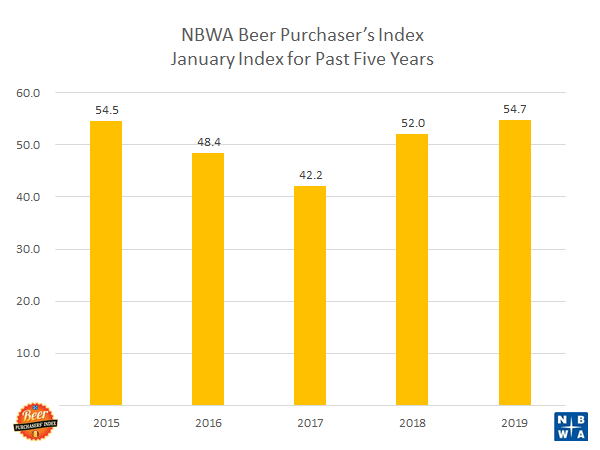 Alexandria, Va. - Today, the National Beer Wholesalers Association (NBWA) released the Beer Purchasers’ Index (BPI) for January 2019. 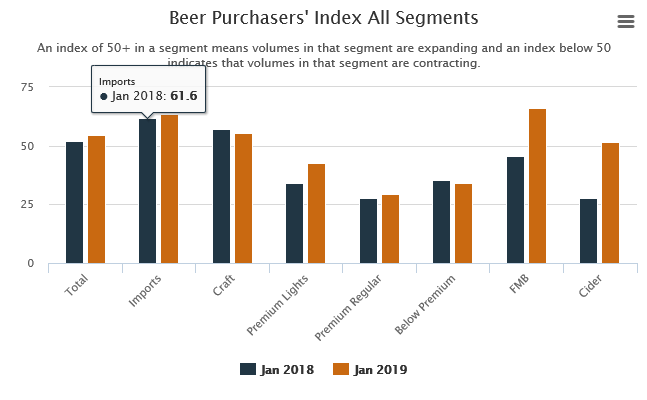 The January 2019 Beer Purchasers’ Index at 55 for total beer rose above the January 2018 index of 52. The January index reading broke a four-month trend of readings below 50 for the industry. This is also one of the highest readings the survey has recorded for a January over the past five years. The index for imports continues to indicate expanding volumes with a January index at 64 compared to 62 in January 2018. The craft index at 55 is only slightly below last year’s reading of 57, and the index indicates a very slight expansion in the volume in craft beer orders. Premium lights and premium regulars posted higher readings with premium lights picking almost a ten-point gain from an index of 34 in January 2018 to an index of 43 in January 2019. Below premiums dropped one point over last year. All three segments continue to struggle with below 50 index readings. The flavored malt beverage/progressive adult beverage (FAB/PAB) segment continues to show expansion with a 66 index reading that is significantly above the 46 reading from last January. The cider segment also continues its strong recovery, growing to a January 2019 reading of 52 from a 28 index in January 2018. This is the segment’s fourth monthly reading above 50. The “At Risk” inventory measures for total beer was 51, one point higher than last year. The February 2019 BPI survey runs from Feb. 7 through Feb. 15. Results will be released to participating distributors on Feb. 18.